30 Top Construction and Restoration Industry Leaders share how they "Get Paid"! Whose fault is it? What can you do? How do you fight these guys? Jim Thompson -- CEO at Jim Thompson & Co.
We even found a special restoration collection agency that has already collected over $20 million for contractors - the owner gave us two chapters to get you started (with a link to free videos). Did you hear about the contractor who was threatened by State Farm? They told everybody he was the crook! So he sued them and walked away with $14.5 million of their money! We talked to one lawyer who said that if his client had been cheated by an insurance company for even $39 he would take the case. Why? Because when he wins, the other guys have to pay his fees! We just talked to a contractor this week, who had been told by the insurance company they would not pay his $4000. He called Harvey Cohen (one of the authors) and waited as happily as if the money was already in the bank. Why? Because Harvey's firm never loses a case. Another contractor called one of the authors (who is not an attorney) to explain that an adjuster refused to pay him $3000 in drying fees that had saved $10,000 in cabinets. There was no court, no "going legal." John told him a sentence to say to the homeowner's agent. The contractor did it and minutes later, the adjuster called to say that--by golly--he was going to pay the full amount after all. Or how about Jim Thompson? In just one year he had the privilege of paying $2,000,000 in taxes! And that was after he wrote off his yachts, jet skis, RVs and private plane - legitimately! When a man tells you that he has found a huge niche market in which you get paid in a few days (instead of months), adjusters rarely (if ever) try to reduce your invoice, you can earn six figures on a single job and you can do it with equipment you already have - he has our attention! insider secrets to help get you paid! We will even deliver it to your email in less than 24 hours from the time you order it - in unlocked PDF form so you can print out a page to share with your team, or an entire chapter or the whole book! We believe this is the finest collection of "Get Paid," articles in the world. Read them, use the knowledge you find within them. Get paid! If you are not fully satisfied for any reason, just contact us within 30 days -- for a full refund of your entire purchase price. In fact we won't even ask you to send the book back - what's the point? It is an eBook and even if you tried to send it back, you would still have it! Just $197 for the book, the bonuses, the free consultations – all of it! Attorneys charge more than that for one hour of their time. Five of our authors are attorneys. Why not see what they have to say? And if you don't agree that it will save you or make for you at least 10 times the investment, you get your money back! We are using PayPal - one of the most secure payment methods anywhere. You don't have to join PayPal to use their service. Just ignore their offers to join and use the "guest" method. Just use the prompts for those who aren't PayPal members. 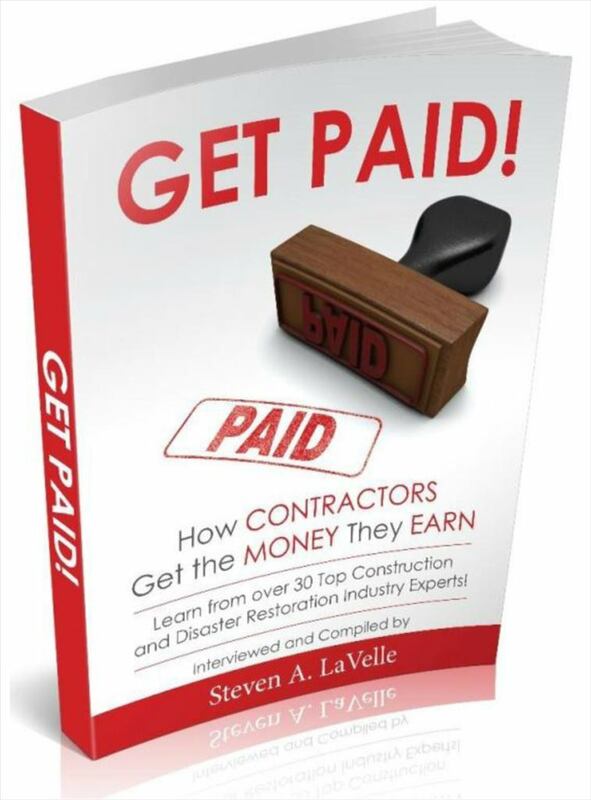 The ultimate, new restoration industry book for all business owners and managers. Get your digital copy today!